Winters in Kansas can be harsh, and you want to help your engine stay in good condition despite cold temperatures. To help you do that, we at Eddy's Toyota recommend Toyota Super Long-Life Antifreeze. Right now, when you purchase Toyota Super Long-Life Antifreeze from the parts department at Eddy's Toyota, you'll save with a special price of only $21.71! This special pink formula avoids using harmful silicates while staying extremely durable. It's specially designed for Toyota models, and it won't corrode aluminum surfaces like coolants that contain borate. It's pre-diluted 50/50, so it's ready to go. Toyota Super Long-Life Antifreeze is compatible with Toyota red Long Life Antifreeze/Coolant, and it's perfect for the cold weather. 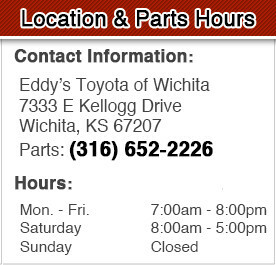 Come to Eddy's Toyota of Wichita to get your Toyota Super Long-Life Antifreeze today!